The 70th anniversary of a peacetime aviation tragedy has been honoured at the official unveiling of a permanent memorial plaque at Point Lookout on Friday. Division 2 Councillor Peter Mitchell said the memorial would stand as a poignant reminder of the lives lost in the tragedy. 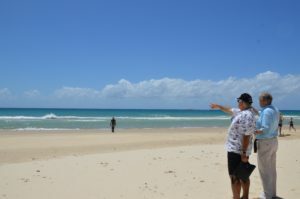 “The Netherlands East Indies aircraft was just 23 minutes into its flight from Archerfield on 26 February 1947 when it crashed into waters off North Stradbroke Island, claiming the lives of all six men ­on board,” he said. Surviving family members of the men and representatives from RAAF, Redland City Council, Quandamooka Yoolooburrabee Aboriginal Corporation (QYAC), Dutch Club of Brisbane, Redlands RSL and the community were amongst those who gathered at today’s unveiling. 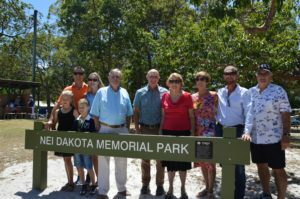 Cr Mitchell said Council was pleased to be able to support the request to name the new park, which was formerly a road reserve, NEI Dakota Memorial Park following consultation with the community. “Never afforded the opportunity to lay their loved ones remains to rest, it is my hope that today’s park dedication ceremony goes some way to acknowledging these families’ grief. In recognition of the anniversary, proceedings were followed by an official Royal Australian Air Force C-17A Globemaster III fly-over. Caption: David Bell and Ruurd Bekema look to the area where the plane was lost. David Bell of the RAAF Base Amberley Scuba Club, who coordinated memorial efforts, said it had become a passion to commemorate the NEI Dakota following sections of the plane being located in 2003. “This aviation tragedy and the wreckage that still lies at the bottom of the ocean has become a sort of folklore over the past 70 years, so to have this memorial as a reminder will help maintain the story and the memories of those lost,” he said. Mrs Fay Barkwith, whose husband Hotze Bekema died in the tragedy and family funded the memorial plaque, said although 70 years had passed, memories of the time were still fresh. “My two eldest children were just two-years-old and two-months-old when the accident happened,” Mrs Barkwith said. “We returned to the island in December 2016 to celebrate my daughter Angenietje’s 70th birthday and we heard of the park being named. From left: Lilly Gatehouse, James Gatehouse, Peter Gatehouse, Lee Gatehouse, Ruurd Bekema, Cr Peter Mitchell, Fay Barkwith, Angenietje Gatehouse-Bekema, Timothy Gatehouse and David Bell.